Quantum the Train found himself drawn to the surface of the blood moon and there was nothing else to do but land. Lapinette and the Wabbit hopped out to investigate. But they'd only set paws on the moon when Quantum shuddered into slipstream drive and took off. The Wabbit shrugged and sighed. "They'll have to cope on their own." Waves crashed lazily on the beach. "We're marooned, Wabbit," said Lapinette. "We have each other," grinned the Wabbit as he waded in the shallows of the scarlet sea. It was even hotter on the moon's surface and Lapinette was irritable. "What about that moon? I didn't see that other moon." "Maybe it hid round the back," said the Wabbit. Lapinette stamped a foot and seaweed crackled and popped. "Round the back of what?" "Round the back of the moon we're on now," said the Wabbit. "Moons don't hide," said Lapinette. 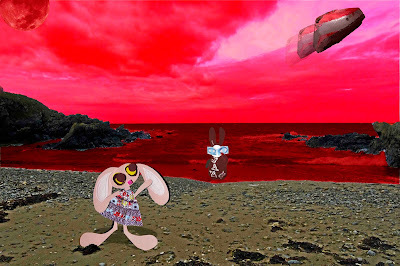 The Wabbit shrugged again and he put a paw into the sea and scooped some up. It was gloopy and sticky. He sniffed it. Lapinette watched closely. "That sea looks like blood." The Wabbit sniffed again then cleaned his paw on the sand. "Because it is blood." Lapinette sniffed too and made a face. It smelled like rusty iron - and another musty odour that reminded her of an old engine she could never get working. "There's a lot of it," grimaced Lapinette. "You can't make blood," said the Wabbit. "Something brought it here." Lapinette nodded gravely. "Something with blood on its paws ..."